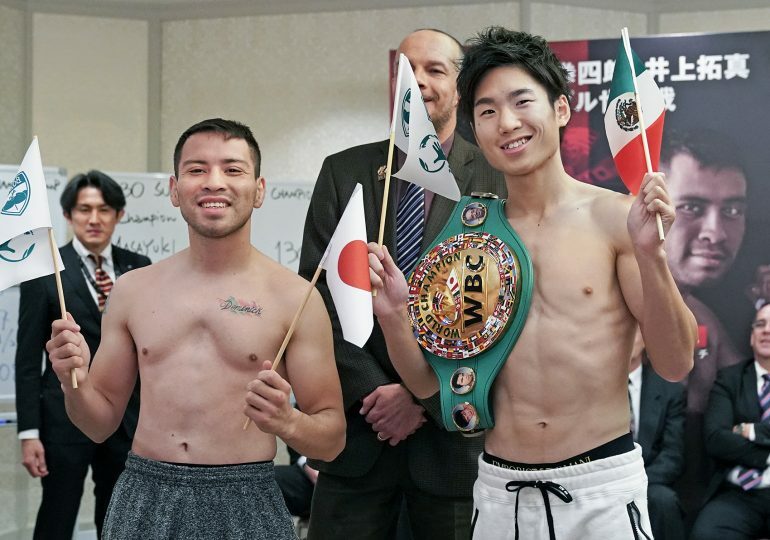 TOKYO — In front of a packed house at the Ota-City General Gymnasium on the last card of the year in Japan, a brilliant triple-header got started with Ken Shiro defending his WBC light flyweight championship with a unanimous decision over Saul Juarez. Shiro (15-0, 8 knockouts) earned scores of 119-109 on two cards and 120-108 on the third to retain his belt for the fifth time since winning it in May of 2017. Juarez was warned in the third for a low blow, which seemed to only invigorate Shiro who dodged more sweeping hooks and connected cleanly with his own, sharper hooks. The tough Mexican was keen to get his licks in and gave Shiro a solid right on the cheek, to remind him why boxers don’t normally fight every two months, which is exactly what Shiro was doing tonight. A nice exchange in the fourth let each fighter feel the other’s power, with body shots galore and now more flush rights from Shiro. Shiro started to begin looking comfortable and took aim with two left hooks to the body that would pay dividends. The fact that Shiro was finding him so cleanly early on would tell the tale for the rest of the night. Shiro looked clean and focused in the corner before the sixth while Juarez was reddening across his face. The pesky challenger kept giving Shiro fits but left himself vulnerable to more left hooks to the body. Shiro had predicted a game ending KO in the middle to later rounds and was now on pace to do so entering the seventh. The body shots began taking a toll on Juarez who let his guard down in the last thirty seconds of round eight and was hit with a left and a right square on each cheek. The tough Juarez, a native of Mexico City, took the punishment and kept firing throughout the next round, though backing up and trying to escape a charging Shiro who wasn’t letting up. Juarez wouldn’t go into the night easily, in what was supposed to be an easy tune-up for Shiro to begin the card with a KO for the home crowd. Instead, Juarez took Shiro into deep waters, making it to the twelfth. Shiro tried to close the show with late surge in the final seconds but was unable to do so. “Juarez was moving his head a lot and it wasn’t easy to connect. I have a lot of things to self- examine,” said Ken Shiro to the crowd afterwards. Shiro will now retire for the New Year’s holiday and root for his countryman, Hiroto Kyoguchi, against RING champion Hekkie Budler tomorrow night as they both hope to stage a unification next year.